There's bound to be a company in your industry that is just killing it. Maybe that's you, which in that case, AWESOME! If it's not you, but you're wondering how these companies have become so successful at SaaS marketing and sales, today we're going to let you in on a few secrets. If you read our post from last week, part of the reason these companies see so much success is because they know their 'why' and they've been able to communicate it effectively to their prospects. Another reason, aside from their why statements, is that these companies likely have very strong sales teams. Sales is important for SaaS companies and if you master the art of inside selling, you'll likely rise to the top more quickly. Our friends over at InsightSquared teamed up with HubSpot to produce the first-annual Inside Sales Benchmark Report. This report is jam packed full of information helping you to understand some of the secrets behind successful SaaS sales teams. We highly encourage you check out the report, but we also wanted to share a really great infographic that the team over at InsighSquared put together. 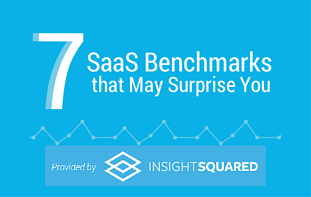 It highlights 7 SaaS benchmarks pulled from the findings in their report. And we've got to say...these will probably be surprising! InsightSquared is the #1 Salesforce Analytics app for data-driven business executives and their teams. As a Business Intelligence (BI) solution that delivers powerfully simple analytics, InsightSquared is designed to give you deeper insight into how your company is performing, and provide you with the data you need to grow and scale your business. With Sales, Marketing, Finance and Support reports, you'll have real, actionable business analytics at your fingertips.